Oh Look, I've Been Crap With the Blog Again! Oh Look, I’ve Been Crap With the Blog Again! No surprises there, really, for anyone who is familiar with the many-hatted multi-tasking juggling act that is my life! Today, rather than give you a swift summing up of my last 5 months (my usual modus operandi after a hiatus) I want to focus on how much winning the 2012 Rattle Readers’ Choice Prize means to me. Firstly, I want to say that Tim Green, Rattle’s Editor-in-Chief, is, to my mind, the perfect editor of a 21st century literary journal. He has always been unfailingly courteous and prompt in his dealings with me, and even his rejections (of which I have received several!) have been courteous and encouraging. I have never felt that he possesses ANY prejudice against formal poetry–in fact, quite the opposite, I believe he genuinely wishes he received MORE of the good stuff. While the Readers’ Choice prize is allocated entirely by popular vote, my three sonnet sequence, “Zeitgeber,” would not have been in the line up were it not for Tim’s own eclectic taste. Thanks Tim! Let’s look at those readers for a second. 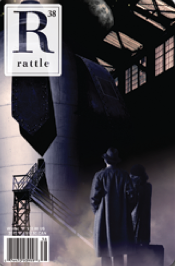 Rattle only publishes poetry, along with “conversations” with notable poets, which suggests to me that most of the readers are poets. The logical inference would be that…hey, on some level, readers LIKE formal poetry? Even if they don’t write it themselves? I could segue into a rant about how it arises that, if readers like it, judges don’t (or at least, that they prefer free verse), but I won’t, because today is a happy day. What today demonstrates to me is something I have dared to hope and suspect all along–that formal poetry (poetry in received forms, or written with rhyme and meter) strikes a deep chord in the reader because of its complex and beautiful patterns, that the human ear enjoys the aural patterning of, say, a sonnet, and that, despite what the late twentieth century critics may have claimed, formal poetry is not dead and will, in fact, never die. Wowee! That’s wonderful, Anna. So much better to be the readers’ choice than one judge’s, don’t you think? Major congrats!